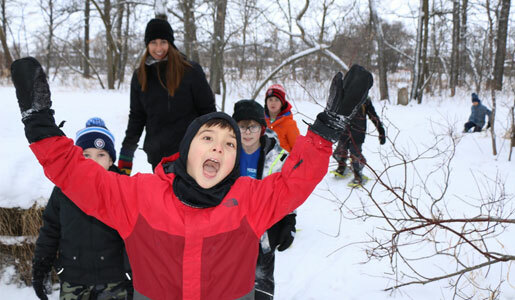 Camp Manitou started 2019 off with a “new year, new camp opportunities” kind of mentality as they hosted their first ever Winter Break Camp. From Jan. 2 to Jan. 4, 35 children between the ages of 8 and 12 had the chance to participate in the winter camp. Camp Manitou has always been a place to grow positive relationships, self-confidence, and independence. With the new Winter Break Camp, all of that can continue even after the snow flies. The winter camp brought never-before-seen programming to Camp Manitou, such as broomball and mini-igloo, snow fort, and birdfeeder building, along with regularly-offered winter activities like cross-country skiing, tobogganing, and bannock making. The wide variety of activities gave participants the chance to enjoy a blended experience of outdoor and indoor programming. Children also had the opportunity to grow their teamwork, responsibility, and resourcefulness skills by connecting with nature and the outdoors. Equipment upgrades to broomball, cross-country skis, and snowshoes meant everyone had the opportunity to participate in activities together. “I love that I get to come to camp in the winter time too, and it’s so much fun!” said Madi M., a Winter Break camper. Each day ended with a big group skate on the brand-new covered rink at Camp Manitou, and hockey games or casual skates filled the ice until it was time to go home. Children loved the new facility so much that staff had to pull them off at the end of the day just so the Zamboni could flood the ice. The whole experience was made much more enjoyable by Mother Nature, who cooperated with the inaugural winter camp and filled the days with sun and warm winter air. With exciting changes happening to facilities, activities, and landscapes, Camp Manitou has become a great winter destination for children and rental groups, and provides new opportunities year-round. Campers won’t have to wait until summer for their next opportunity to enjoy Camp Manitou again, with Spring Break Camp on the horizon for spring 2019!